Flojet Pentaflex� Series 7.0 GPM High Pressure Pumps � the industry�s most powerful diaphragm pump. The FloJet Pentaflex R7300132A electric pump for bleach and other corrosives is perfect for the delivery of roof cleaning chemicals. There are several models of the Pentaflex pump on the market, but the only one we sell is equipped with a Santoprene diaphragm and Viton valves to stand up better to some pretty tough and corrosive chemicals. It is a 12-volt model so that it can be powered by any automotive power system or battery. 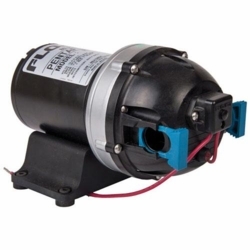 The Flojet Pentaflex pump is engineered and constructed with the latest co-injection mold diaphragm technology, which virtually eliminates potential leak paths. This latest innovation offers unequaled pump performance and life. The unique five chamber design allows this pump to deliver 80 PSI and 7 GPM.